1 of 2 In a large bowl, cover rice noodles with 2 inches very hot water. Soak for 10 minutes. Microwave for 2 minutes. Let cool slightly, then carefully remove noodles to a cutting board, reserving 1/4 cup of the soaking liquid. Cut noodles into thirds. 2 of 2 In the same bowl, whisk together reserved liquid, vegetable oil, soy sauce, vinegar, curry powder, sesame oil, ginger and garlic. 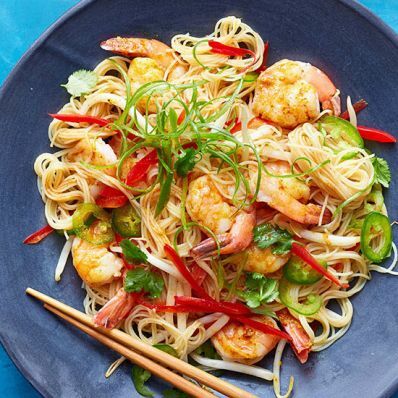 Return noodles to bowl, and toss with shrimp, red pepper, scallions, bean sprouts, jalapeno and cilantro. Per Serving: 717 mg sodium, 29 g pro., 2 g sat. fat, 221 mg chol., 4 g fiber, 44 g carb., 15 g Fat, total, 427 kcal cal.